Get a sense for the top attractions in Cartagena during this 4-hour shore excursion designed with cruise ship passengers in mind. Explore the unique Moorish and Republican architecture of the city’s Manga Island, take in gorgeous views from the hilltop Monastery of La Popa and check out historic San Felipe Fortress. You’ll also enjoy an hour-long walking tour of Cartagena’s atmospheric old city and do some souvenir shopping at Las Bovedas. 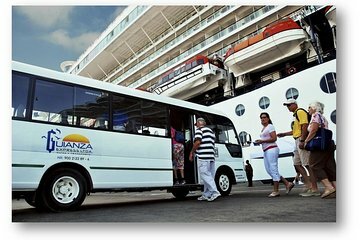 Your excursion also includes round-trip port transport, a professional guide, and light refreshments. We were a group of 3 people, who thoroughly enjoyed the private city tour. The guide was informative and kind. The vehicle was air conditioned and comfortable. Most of all, we avoided the crowds and were able to see the sights that we preferred. Saw everything on the list at a comfortable pace. He could speed up and slow down quite perfectly. Ishmael, my guide, helped me with my Spanish and was great with his English. He respected me and other tourists we encountered and was funny, thoughtful, well informed, and likeable. He took delightful photos for me, explained interesting sites at view points, brought meaning to chapels and buildings, gave a great mixture of culture and history with time to shop, to move along to another view area. He verified my interests and arranged his tour to make me very happy. Really great time! The tour guide was professional, knowledgeable and on time. We had a driver and a guide. We enjoyed hearing about the culture and history, walking thru the historic district, going to Bocagrande, and new town. We highly recommend this agency for future bookings. Our guide Nico and driver were great. They really gave us a complete tour of Cartagena that made the most of the time we had available. They really made us feel at home.